Look at how much work these bluebirds are getting done! 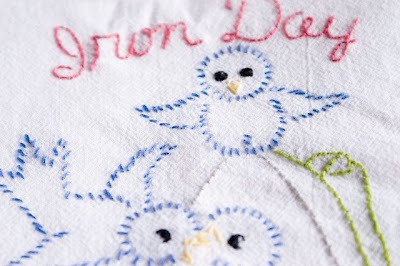 And how much I'm avoiding when I sit and embroider . . . .
Sooo cute! I love embroidery! I love these busy bluebirds! Where did you find the transfers? My searches for cute transfers has been stymied by a few too many hens in bonnets. Sublime stitching helps, but when it comes to sweet household stitchery I've hit a wall--only have floral day of the week transfers, and that's it. Those are so sweet! I have pillowcases all ready to embroider on my upcoming trip with my mom and sister. 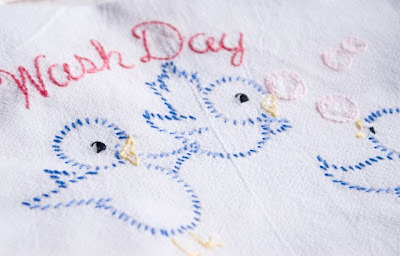 Oh, I love vintage linens! I have waaaay too many tea towels, but they are just so hard to resist. Beautiful and sweet! Lovely linens. One of my favorite things to do. Especially little birds. Polly, have you tried the ebay store called "Aunt Martha Transfers from Pauli"? There's a cute Miss Kitty there, and Helpful Puppy, among other things. love those - they're adorable. I like www.patternbee.com for transfer patterns like these. Lots of variety out there. You inspire me. I'm off to finish my embroidered table runner now. Those are beautiful Anna! I love dainty embroidery! These are adorable, I have this pattern and you've really made me want to get them stiched up!